On October 6th, at the annual appreciation luncheon for our El Cajon, East County Meals on Wheels route, Foothills United Methodist Church was presented with a proclamation from Art Madrid, the mayor of La Mesa. 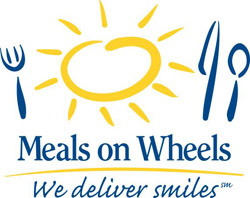 It congratulated our church on 20 years of continuous service to the meals on wheels program. The proclamation was even read by the CEO of Meals on Wheels, Debbie Case. We had a full table of volunteers at the luncheon to receive this outstanding award. We gave three cheers for Foothills, for you have been very faithful over the years in support of this outreach ministry of our church. To date, we have completed 5 years with a route in El Cajon and 20 years serving a route through Lemon Grove and Spring Valley. Congratulations to you all. One of the greatest needs right now is to find someone to do the scheduling of the El Cajon route. Charlie Folkner currently faithfully schedules the Lemon Grove/Spring Valley route. Of course, volunteers to deliver meals to these two routes are always needed. Please contact Charlie Folkner at 670-5971 or Don Jenkinson at 472-0573 for further information.